The official Norton Store has just given us a a really good coupon for their most popular product, Norton Security (which is all new for 2015!). 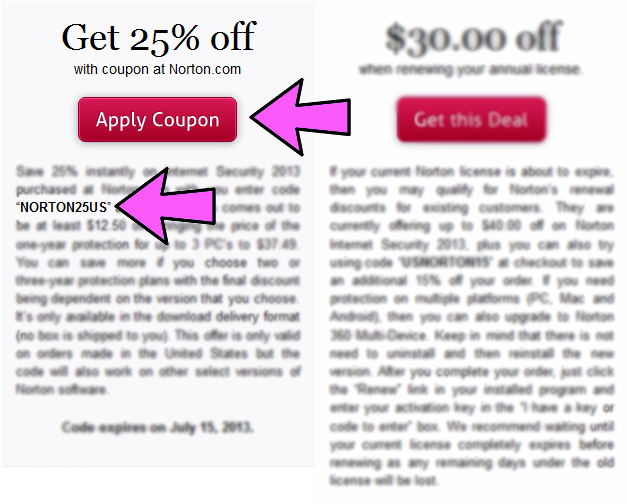 You’ll be able to save $30.00 off the list price between now and the end of the month when you enter NortonSecurity30OFF at checkout. Plus you will also qualify for a free upgrade to the 2016 version with your current subscription once it’s released in late-September. All Norton products are available as a download so no box is shipped to you and you can install it right after checkout. This offer is only valid on orders made in the United States. Norton Security on sale at Amazon. 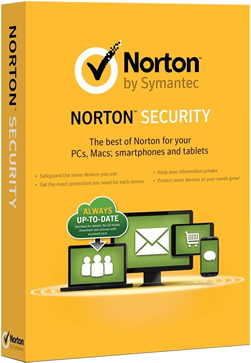 Pick up your copy of Norton Security 2015 on sale at Amazon, one of Symantec’s top resellers, for up a little over $35.00 off the list price. That comes out to be as low as $41.33 for protection on up to 5 devices. All versions are available in both download and boxed formats. If you choose the download format, you’ll be able to download an install the software immediately after checkout. If you go with the box, they will ship it out to you for free. No extra discounts are offered yet but keep any eye out for sales to begin in a few weeks. Prices and discounts will vary – See site for offer details. If your current Norton license is about to expire, then you may qualify for Norton’s renewal discounts for existing customers. Depending on the version that you are currently running, you may be able to save up to $20.00 on your upgrade. After you complete your order, just click the “Renew” link in your installed program and enter your activation key in the “I have a key or code to enter” box. We recommend waiting until your current license completely expires before renewing as any remaining days under the old license may be lost. Only need a single license? On Norton Security for 1 Device. If you just need antivirus protection on a single device and don’t plan on adding protection on any new computers in the months to come, then Norton Security for 1 device is all you need. And right now with their back to school special you’ll be able to get $15.00 off your order instantly. Just follow the above link to apply the discount – You’ll be taken directly to the shopping cart with the product marked down from $59.99 to $44.99. This offer ends on October 2nd, 2015. Norton Security w/Backup for 10 devices. As with most antivirus software, the more licenses you buy upfront the cheaper it costs you per license. Symantec already has a great deal on Norton Security with Backup for 10 devices for just $89.99. But with their end of summer deal, you’ll now save $30.00 instantly on your purchase when you apply this instant coupon code. That means you’ll end up only paying $59.99 which comes out to be under $6.00 per device. That’s by far the lowest price you’ll find anywhere on Norton Security with Backup. Expires on October 2nd, 2015. The Student and Teacher Discount. You can get a student discount on Norton Security but it’s usually not as good of a deal as you’ll see on the regular versions. You will see that the student versions available at Norton.com directly are priced at 50% off the list price while some resellers like Journey Ed and Academic Superstore have it for up to 60% off the list price. Because you can’t add or combine additional coupons on top of the already discounted academic pricing, we only recommend you go through the hassle of getting verified as a student only when a better offer is not available. We have an entire section dedicated to student software discounts where you can find for information on how to qualify for this offer. Are you new to Norton? Haven’t yet tried their 2015 internet security product line? Then you will qualify for the free trial. You can download and test any of the latest versions for 30 days free without obligation to purchase. Simply select any of the versions you would like to test from their download center and follow the installation instructions. Just be sure that any older or currently running antivirus programs are either deactivated or uninstalled. After the trial period, the software will automatically stop functioning and will require you to enter an activation code if you decide to purchase the annual license. As you’ve noticed, there are a number of different deals available on Norton Security. Some require you to physically enter a code a checkout to get the lower price while others are already listed on sale and open for anyone to use. From those promotions that need an extra action on your part, we’ve outlined five simple steps in helping you get the best price possible. Step 1: Select the deal that you would like to use. Within the description there will be a code listed. Copy the code exactly how it appears minus the quotation marks. Step 2: One the code is copied, click on the “apply coupon” link. 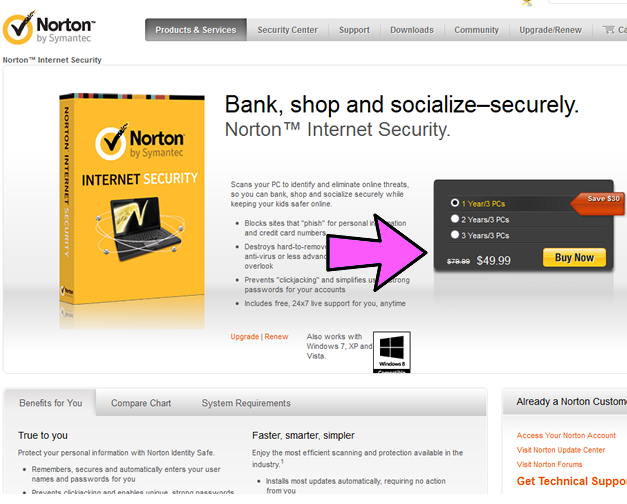 This will take you to the Internet Security product page on Norton.com. Step 3: On the right-hand side there will be three different radio buttons to choose from. If you know that you will be using your laptop for one than a year, we recommend that you either choose the two-year or three-year plan as it already will include a multi-year discount. Once selected, go and click on the “buy now” icon. 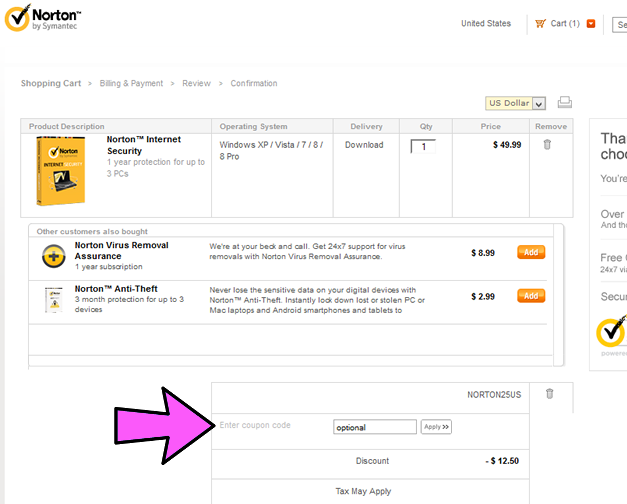 Step 4: You should now be on the order confirmation page with Norton Security 2015 added into your cart. In the middle of the page there will be a gray “enter coupon code” box. Here is where you will need to paste in the code that you copied in Step 1. Just be sure to include the code in its entirety without any additional spaces. If everything looks OK, click “apply”. Step 5: The discount should now be reflected in your shopping cart. If not, recheck the code and try again. If it still doesn’t work, it’s possible that the deal expired earlier than expected or than you’re trying to use a coupon for a product or version that is excluded from the offer. We’re here to help so if you have any questions, just shoot us an email and we’ll do our best to make it work! Norton 2016 Release Date Alerts! Will 2016 versions of Internet Security be released soon? Expect to see the 2016 version become available sometime in September, 2015. 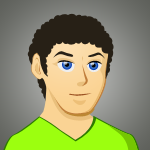 There will also be a free beta open to the public a few weeks prior to the official release. We are monitoring all of the latest release rumors and posting the expected new features on our Norton 2016 news page for more details.